Favorite TCG game and favorite decks! Today, he's observing what seems to be a dangerous duo. Two tall and broad-shouldered men were innocently eating ice-cream while their surroundings were destroyed! And Conan suspects they're involved with this... When one of those guys took off his sunglasses, Conan could see that he was blind on one eye. He also seemed to be a heavy smoker and carried black ofuda with him. The other one always kept going about how he was going to fulfill wishes. What are they, some kind of fairies? Help him out with the right characters and series and you can get up to 4 random cards! Your deadline is September 20! Last round's answers were Sakura from Card Captor Sakura and Krad from DN Angel! You have until September 20 and can get up to 3 random cards, as always. Good luck! Can you tell him where he is? You get 3 random cards if you get the location + series correct! You have until September 27! 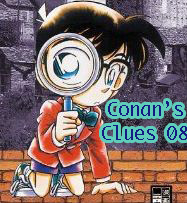 The person Conan is investigating today is pretty rude too! He's about Conan's size and ate a full basket of tomatoes while insulting Conan every now and then. But the thing is, he destroyed a lot of things at a private property that obviously didn't belong to him. It didn't even seem like it was deliberate, he might be just a klutz, but Conan has to make sure. He makes really strange noises when you touch a certain lock of his hair, too... Who's this peculiar person? Tell me the name and series until September 13 to get 2 random cards! You have until September 13 to answer. Good luck! CLOSED! 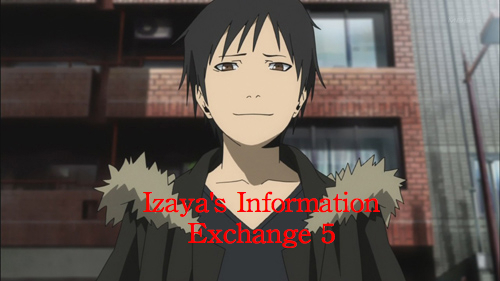 Izaya thanks for your help! He will now go molest gather some more information! The answers for last round were Yuzuriha Nekoi (X/1999), Iwakura Lain (Serial Experiments Lain), Koizumi Itsuki (Melancholy of Haruhi) and Shinichi Kudo (Detective Conan)! Ryoga thanks you for your help! He was lost in Germany, in a small town called Ruhenheim (from the anime Monster which I can really really recommend *_*). The place he stranded at today is pretty beautiful... do you know what it is? Tell me the location and the series until September 13 to get 3 random cards! This time, he suspects someone to be a peeping tom. Said person did say something that sounded really profound though: "If you have time to think of a beautiful end, then why not live beautifully until the end?" Who is this? I made a grave mistake last week. I completely forgot that up until now, I only used series that were included in the TCG since it's hard enough to guess a scenery! So I'll give you some huge tips this time, it will be boring if no one guesses correctly after all! ;3; Naoki Urasawa is the mangaka of the series I'm looking for. This alone might be helpful already since not many of his manga have an anime adaptation I could take screenshots from. Additionally, this was his most famous work, praised by many viewers and critics alike. Almost the entire plots takes place in only two countries, so you could just guess where the location in the screenshot is. I'll give out an additional card if you can tell me the exact city and not just the country. You have one more week to look at round 6! Sorry about this, I hope it will never happen again! Starting from now on, Conan also lets you guess doubles (every 3rd round) instead of just one single person! This time, it seems that the offenders's crimes are really serious. They are on the wanted list and one of them supposedly even slaughtered a whole village! They are called "Zombie Twins" by some and there are strange rumors about SM and tentacles surrounding those two... who are they...?! I hope Conan will keep a safe distance from them when he inspects them! Rewards are 4 random cards! You have until next Monday, August 30. Everyone who thought that Miria was Fuu from Samurai Champloo and Isaac France from Hetalia was correct last round! This round is open until next Monday, August 30. Conan needs your help again! Last time, it was Abarai Renji (BleacH) who disturbed the neighbors, but it ended peacefully. It seemed that he cooled off after fighting with some guy. Now this person is suspected to be a spy. He seems to be a skinny pale boy with light hair and eyes that are occassionally red. Conan spotted him floating around and humming Ode to Joy! To top it off, he said something like "This time, I'll make you happy for sure!". It sounded kinda... gay... Who or what is he?! Rewards are 2 random cards. You have until August 22nd! Edit: Ahhh, sorry, I completely forgot I always took series that were included in the TCG so far >,<;; This one isn't! I'll give some hints after a week or change the picture if it's too hard! Rewards will be 3 cards. You have until August 29! Wow, after 4 long weeks Ryoga finally got away from the ocean! Last time, he was stuck in the sunken plane "Gelnika" of Final Fantasy VII (some of you even knew the details, it was the cargo / helicopter room with the Hades materia! XD). But... who would have thought? Ryoga is still lost! What... is this place?? You have until August 10 to find out! Rewards will be 3 random cards. Don't forget it's a series included in the TCG. Good luck! You have until July 29. CLOSED! 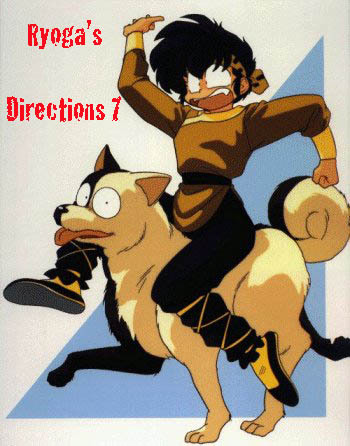 Quick reminder: You still have one week for Ryoga's Directions if you haven't answered yet! Since I'm half on hiatus right now, I'll give you the new round, but will hand out the prizes for round 5 tomorrow, so you have until then to answer if you haven't done it yet. C:< I'll edit the solutions into the post after I close the rounds! You have until July 29th. CLOSED! Rewards = 2 random cards!